Larimer County, Colorado – On Saturday April 3, 2010 Larimer County began a process to install the first solar photovoltaic panels on one of its facilities. 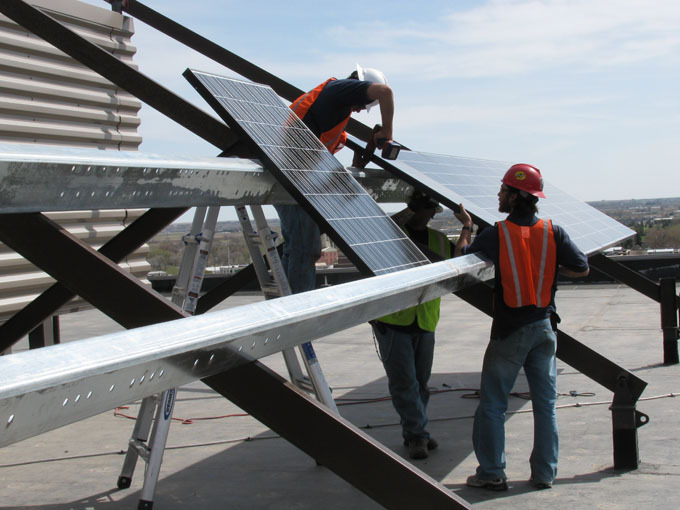 The first panels were fastened into place on Friday, April 15. The 26.82 kW system will soon be up and running at the Larimer County Courthouse Offices (LCCO) Building at 200 W. Oak Street, Fort Collins. There are two solar photovoltaic arrays: the first is 71 ft. wide X 20 ft. high installed at a 31 degree tilt; the second is 140 ft wide X 5 ft high installed at a 40 degree tilt. Larimer County anticipates the system, of 138 solar panels will produce 39,024 kWh annually, offsetting the equivalent amount of electricity the County now purchases from the utility grid. All of the electricity produced by the system will be consumed by the LCCO. On average the LCCO consumes 238,555 kWh of electricity per month – equal to the energy used by 329 homes per month. The system will also prevent 60,000 lbs of CO2 from being emitted into the atmosphere on an annual basis, similar to the emissions of 377 round trip vehicle trips to Denver. The contractor selected for the project is Standard Renewable Energy of Boulder, CO.
• The “Renewable Distributed Systems Integration” or RDSI program, a collaborative program between Larimer County, the City of Fort Collins, Colorado State University, New Belgium Brewery, and several members of the Northern Colorado Clean Energy Cluster in the FortZED District. The project is part of a larger U. S. Department of Energy (DOE) grant. Under this grant, the DOE contributes $45,800, a little better than a one to one match with Larimer County who contributes $35,000. • Funding is also provided by the “Energy Efficiency and Conservation Block Grant” or EECBG program. The EECBG program provided a grant to Larimer County for the implementation of projects aimed at creating jobs, reducing emissions from fossil fuels, and developing conservation and efficiency programs. Of this grant, up to $85,000 is being allocated toward this project. Site contents copyright © 2019 Recorder Online	except as noted. All rights reserved. | 84 queries in 1.188 seconds.